If you’re in a new Mandarin immersion program, just be aware that there are a lot of weddings and baby showers in your future. New programs mean new teachers. And new teachers do what lots of folks do when they finally settle into a good, solid job with a future–they start to look towards their own future. So you’ll see lots of weddings and then lots of babies. It’s a wonderful part of the cycle of life. 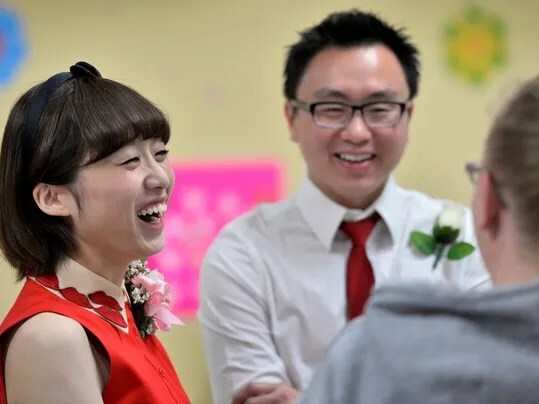 The lunch room at Madison Elementary School was transformed into a makeshift reception hall Saturday as students, staff and parents celebrated the fact that five of the school’s eight Chinese immersion faculty members are set to tie the knot in the coming months. “It’s a wonderful thing to be able to celebrate,” Karen Kruse, a teacher at the school, said. Kindergarten teachers Congyu “Chris” Zhang and Xinyue “Sabrina” Lu along with second-grade teacher Feng Dong, fourth-grade teacher YuHan Chang and Chinese immersion instructional coordinator Hao Li, were the guests of honor Saturday. Zhang and Li will wed May 31 in a dual ceremony with Chang and her soon-to-be husband Ying-Ling Chiang. Chang, Lu and Dong are marrying men outside the circle of the Madison program.